This entry was posted in Anatomy, Neuro, Neurosurgery, Plastics and tagged brachial plexus, nerves, physical exam by Ali. Bookmark the permalink. 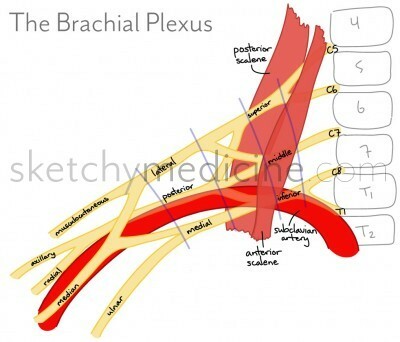 You are correct that the brachial plexus is commonly described as going through the anterior and middle scalene, though there are anatomical variations. I will update the image. this is great! thanks a lot :D is there a part 2?